Thor Heyerdahl, World Citizen, Sails On Rene Wadlow. Thor Heyerdahl, was a fellow world citizen and a friend. We had worked closely together during the Geneva sessions of the United Nations Law of the Sea Conference which was held one year in New York and the next in Geneva. The efforts to protect the seas from pollution owe him much. While the Convention on the Law of the Sea has not revolutionized world politics — as some of us hoped in the early 1970s — it is an important building block in the development of the rule of law. 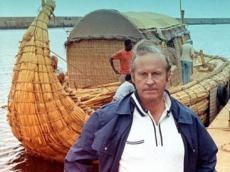 Thor Heyerdahl (1914-2002) was an anthropologist who wanted to demonstrate that migrations across the Pacific, the Atlantic and the Indian oceans had been possible in pre-historic times. His epic 101 day-voyage from South America to Polynesia in the Pacific on the raft Kon-Tiki in 1947, as well as his writing skills, made him well known and respected even by other anthropologists who disputed his hypothesis of migration routes. Thor was always willing to explore new ideas, and he had a wide interest in many different cultures. He was deeply convinced of the need for world law to protect the oceans and the need to show that people of different backgrounds could work together as world citizens for the common good. He was a modest person but willing to use his fame to draw attention to important world problems. I knew him first in 1975 when he came to the UN in Geneva to speak on the growing dangers of ocean pollution. He had just finished one phase of his work on the settlement of Easter Island described in his book Aku Aku: The Secret of Easter Island. He had also tried to articulate the concept of world citizenship by bringing together a crew of people representing a diversity of nationalities, religions and political viewpoints to demonstrate that people could cooperate and live peacefully as world citizens. Thor had a life-long interest in myths that he considered as both symbolic but also as containing elements of the historic record. Thor set sail on a raft for the further shore of life in April 2002. In the Buddhist writings, life is compared to a person wanting to cross a river on a raft. The teachings of the Buddha are both the nature of the logs making up the raft as well as the knowledge of the poleman who controls the raft from the shore of life which is known to the other shore which is the start of territory as yet unknown. For those still on this shore, we have the tasks of saving the oceans from pollution and showing that people of diverse backgrounds can cooperate together as world citizens.